Do you have a recurring nightmare that you’re still in school and suddenly it’s finals and you’re completely unprepared? Even though I’ve been out of school for a decade, I still periodically have that nightmare. I wonder when, or if ever, it will go away. I recently have been having a similar series of panic moments over my upcoming book. It’s been a few months now since I turned in the final draft, and every once in a while, I’ll find myself freaking out because I think I messed up one of the recipes even though I tested and retested all the recipes over and over again before turning in the book. That’s what happened when I made this mug cake. I looked up the recipe and noticed that the original recipe I posted two years ago and the one in the book are different. So I started panicking, but luckily, it was all for nothing. The recipe does work as written (just like all the other ones I recently freaked out over). It is one of the ones I tinkered and improved upon for the upcoming book. 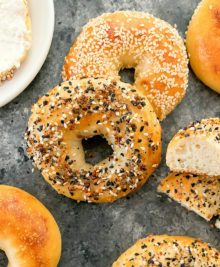 I really enjoy how easy this recipe is. It expands quite a bit in the microwave before deflating a little after it has cooled. It has a sweet, pleasant peanut butter flavor. It also continues to stay moist for hours and the peanut butter flavor actually becomes more prominent if you let it sit for a few hours, though it tastes great straight from the microwave too. 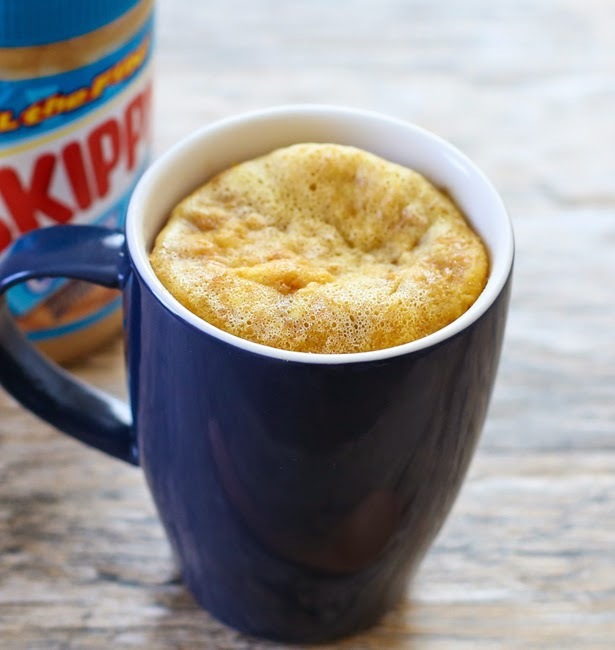 You can check out my whole collection of mug cake recipes here. 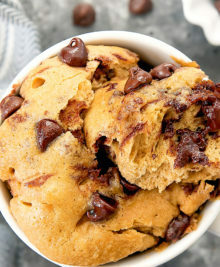 As mentioned above, this recipe is featured in my new cookbook of nearly 100 mug cakes! Update! This recipe is now updated with video. 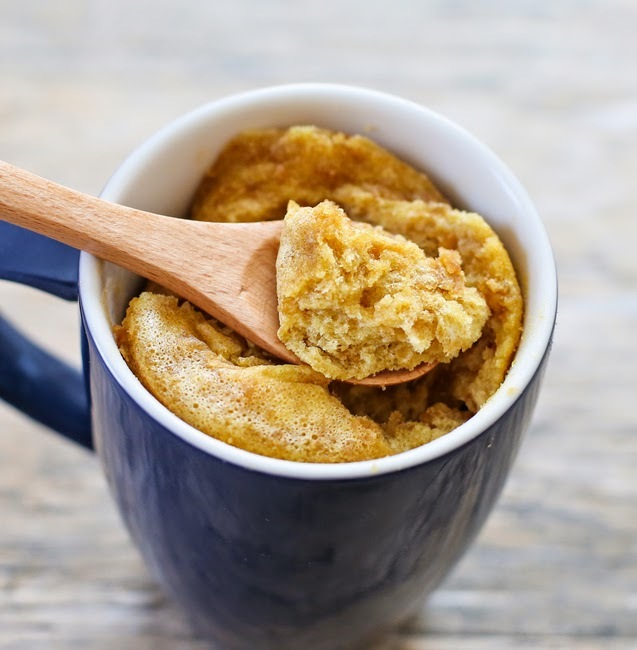 A single serving flourless peanut butter mug cake that cooks in the microwave! I used some called Dark Chocolate Dreams (chocolate & peanut butter mix) and it was so good! i love dark chocolate dreams! You had me sold at peanut butter and flourless! 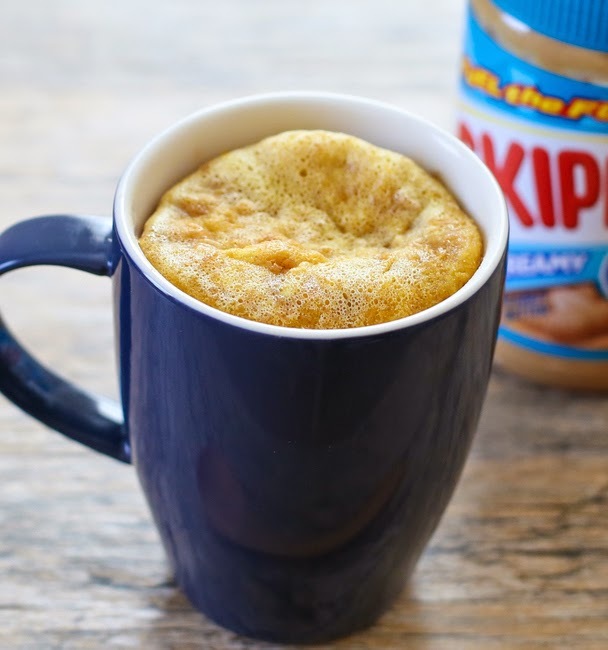 I’ve never tried mug cakes before, but love the easiness of it. 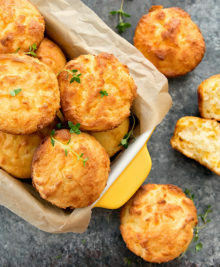 they are delicious and i have a lot of mug cake recipes! I made this tonight (First time ever making a mug cake.) OH MY GOSH it was so so yummy. I was a bit wary at first because I’ve heard about the disaster mug cakes and imagine my surprise when this cake was utterly amazing! It’s so light and fluffy. The only problem I had was it wasn’t sweet enough, but I drizzled some honey on top and that was fixed. so glad you like it! I agree, it’s not overly sweet. I usually make pb desserts less sweet and more peanut buttery and I figure people can always add frosting or a drizzle of something if they want it sweeter. 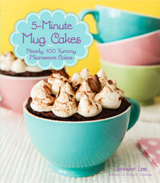 I hope you’ll check out my other mug cakes or my mugcake book! I used a little more sugar – about 1 1/2 tblspoon – and a teaspoon of chocolate powder. It was sooo delicious! I’ve made this twice in two days! I love the simplicity of it and that the texture is like real cake. I used natural peanut butter and subbed erythritol and stevia for the sugar and it was great! I added cinnamon and vanilla extract the second time and it turned out pretty yummy. Did you thoroughly mix all the ingredients? And did you do anything else differently such as change measurements, leave anything out, cook in an oven instead of microwave? 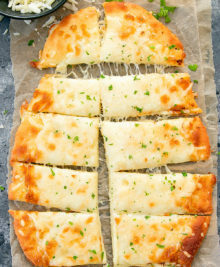 this looks amazing I would love to try but could anyone tell me how many calories please? i loved how easy this was! I threw in some semi sweet chocolate chips and it came out amazing! I’m glad you enjoyed it! 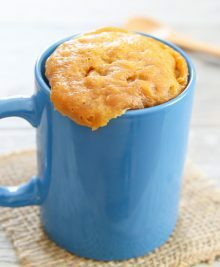 I have many other mug cake recipes for you to try! Has anyone tried this with no sugar or sugar substitute? I’m diabetic so I’ve very conservative with sugars. Thanks! Has anyone tried with extra peanut butter? Make it more gooey?? absolutely delicious! next time I might add banana! How long and what temp could you do this in the oven? We don’t have a microwave. Thanks! Soooo good! I even tried two different versions: nutella, and super chunky peanut butter but I am wondering if you can use egg whites instead. Hmm, I’ve never tried with just egg whites. I’ll have to try that sometime and see. Hello. I was wondering if this recipe would work using splenda? I haven’t tried, but I think it should work! I did it last night and it was wonderful! hi Emily. it’s hard for me to figure out where yours went wrong without me being there watching what you did. Did you substitute any ingredients or change any of the steps? I made a second attempt, and it turned out completely fine and delicious! I don’t know what happened the first time, but I’m glad I gave it a second chance. Yay! i’m so glad you did too. if you’re like me, it probably was just adding the wrong quantity of something without realizing it. This recipe kind of blew my mind. I was pleasantly surprised, this was pretty good. This opens up some new possibilities. Thank you for posting. you might have needed to cook it longer. if it’s not quite done enough, it will sink back down and be dense. every microwave is different. try maybe adding 15-20 seconds next time. another thing could be your baking powder. make sure it’s fresh! 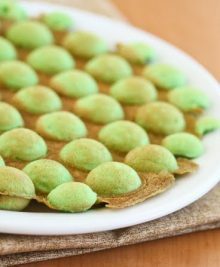 Has anyone tried this with an egg substitute? Like Flax seed? Just made this because I wanted a little something sweet after lunch. It was delicious and it had the perfect texture. Thanks! Can you do anything other than white sugar? I don’t do white sugar or corn syrup. 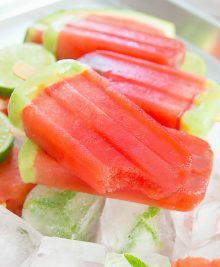 Try to do no sugar other than maybe something like fruit. I saw you mentioned dark chocolate. Did you sweeten it with that? 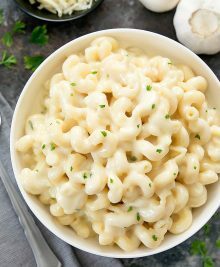 I just tried this recipe today. It is the first time I tried a mug cake recipe. It was absolutely delicious. I subbed out the sugar and just used 1 packet of sweetner and I cooked mine in a bowl so I could add a scoop of double chocolate icecream. O. M. G. !!! 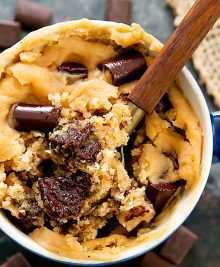 While I wouldn’t say it was cake (more like a really stiff custard), it will be one of my go to sweet tooth craving late night quick snack without killing my blood sugar recipes. Thank you! 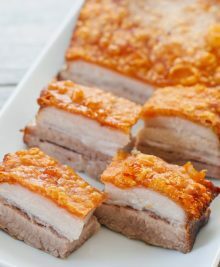 Its hard to adjust to low carb diet since I found out I’m diabetic. This could literally save my life! I made this using Natural Peanut Butter. I thought the Natural PB would be too dense, but it worked out okay. Since Natural PB has no sugar in it, I think next time I will add a little more sugar. Also, Cinnamon and PB is WONDERFUL together!!! Two Tips for your readers: if you have a kitchen scale that measures in grams, simply weigh your PB. My package said that 2T is = 32 grams, so I put my bowl on the scale, zeroed out the scale, and scooped PB until the scale read 48 grams. If you have to use measuring spoons, spray the spoons with Pam (or similar non-stick spray) first, then measure the PB. It should fall right out of the spoon. thanks for sharing your experience! Funny, I just picked up a jar of cinnamon swirl pb. I can’t wait to dig in! Would Almond butter work in this recipe? I just made this, I substituted 2tbls of Xytrol for the sugar (I like sweet) It worked great and wasn’t as sweet as I expected. But much more like cake then I expected, even hubby like it 🙂 Thank you for the great recipe. 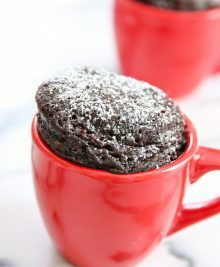 Best mug cake I’ve ever tried! 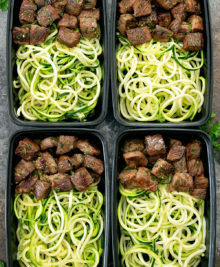 Perfect for my low carb diet! Thank you! Made this for the first time last night! Boy was I surprised. Today I made one using Nutella! Wonderful!! Tasted like a brownie! Think I’ll chop up some walnuts in my next cake! Delicious! I put peanut butter on top at the end so it would melt and I also put Hershey’s chocolate syrup so I could have a chocolate-peanut butter combo. I LOVE it….I used splendor instead of sugar and it came out fine. Very yummy. 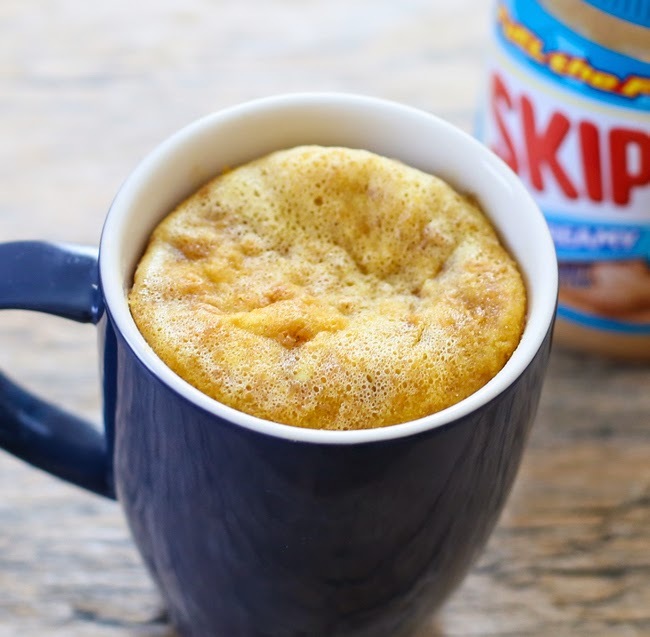 Thanks for posting..I love mug cakes. 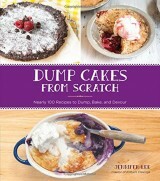 Where can I get your cookbook? Really want to try this but can you use caster sugar instead of granulated sugar? I made this twice. The first time, I used Truvia and it was a complete disaster. The second time, I followed the directions EXACTLY and it was a perfect moist peanut butter cake. The taste and texture were both perfect. I’m so glad it worked out the second time! thank you for sharing! Does anyone know how many carbs are in this cake? I just made this with no-sugar added peanut butter, and replaced the sugar with Swerve for a low-carb/keto version. It was excellent! This was amazing! This is the best mug cake I have ever had. Thank you for posting! aww, so glad you liked it so much! Thank you so much Kirbie! I love cake, my husband isn’t a fan tho so I don’t often bake myself unless we are having visitors. Today I had a craving for cake and I remembered mug cakes from years ago and started looking for a recipe. 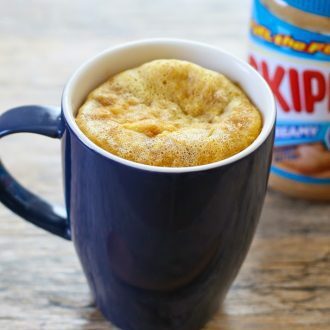 Luckily for me I found your website and while looking around I found your 2 flourless peanut butter mug cakes and thought I had to give 1 a try. I must admit I couldn’t quite get my head around a flourless cake ahead of making it myself.. I ad libbed a bit as I think my eggs aren’t quite as large as they should be and the consistency wasn’t the same as in your video. Wow!! I couldn’t believe it when it came out so well! This was perfect! !